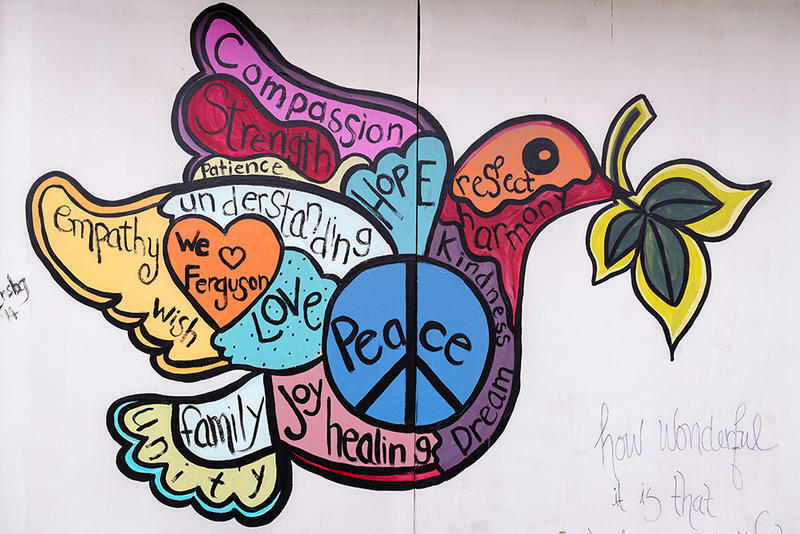 A. J. Rosenberg was the lead artist on "Peace Wish Dove," 2014. Off-duty police officers and a number of others helped paint the 7-by-4-foot piece at an office on West Florissant Avenue. 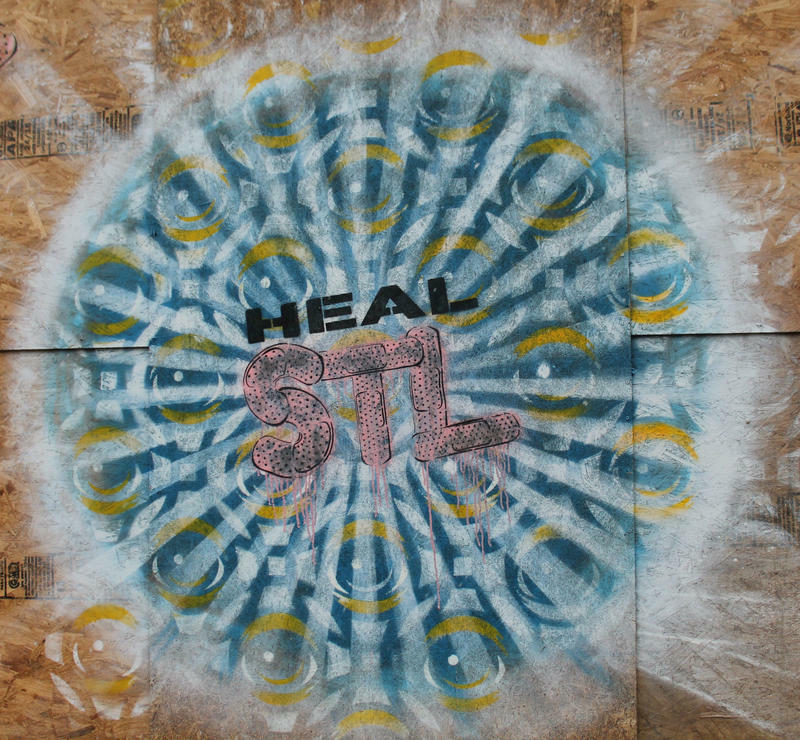 An art exhibition made of plywood, paint and community spirit opens this weekend in St. Louis. The work emerged from the 2014 unrest sparked by Ferguson police officer Darren Wilson shooting and killing 18-year-old Michael Brown. Nights of protest and police action gave way to days of boarding up buildings. After a grand jury declined to charge Wilson in Brown’s death, the protests moved in to St. Louis on South Grand Boulevard. Business owners affixed plywood to their plate-glass windows to cover the damage and protect against more. The importance of the work wasn’t always acknowledged. Some of it ended up in dumpsters, curator Jacquelyn Lewis-Harris said. "St. Louis on the Air" host Don Marsh discusses the "Paint for Peace" exhibition with curator Jacquelyn Lewis-Harris. "They weren’t saying, 'Oh, this is art,'" Lewis-Harris said. "They said, 'This is some plywood with paint on it.' And they just basically threw them out." Many hands helped create this untitled piece at Café Natasha on South Grand Boulevard. The lead artist was Bradley Pipkin. 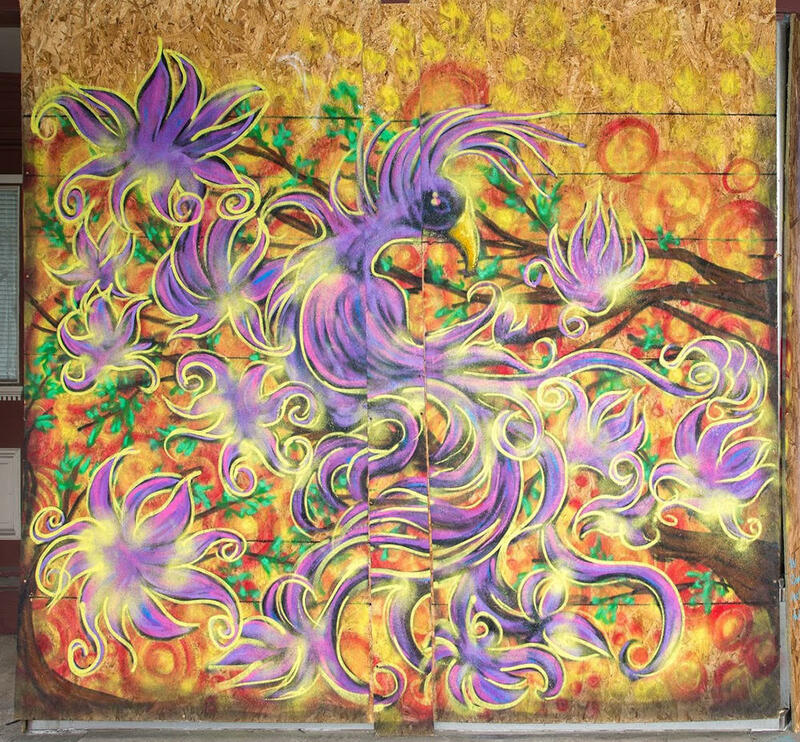 Artists and others who saw the discarded panels as art rescued many of the before the disappeared into landfills. For many months, the panels were stored at a variety of institutions. 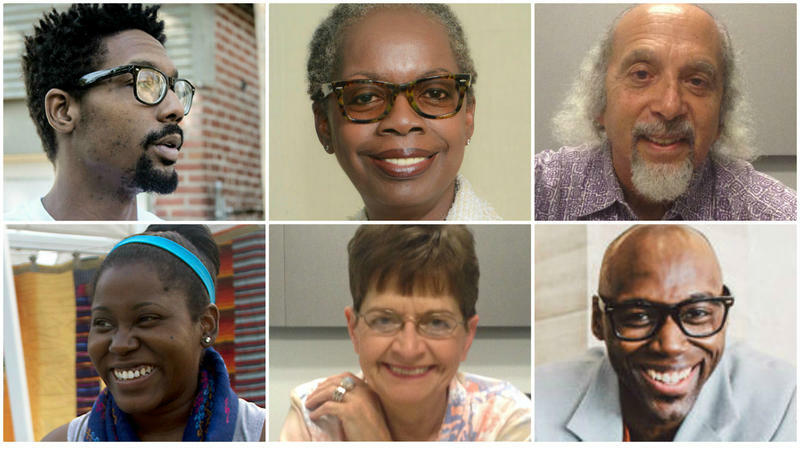 Beginning Saturday, pieces will be shown at Center of Creative Arts, Gallery 210 at the University of Missouri-St. Louis and the Missouri History Museum. Later, more will be displayed in further "Paint for Peace" exhibitions at the Vaughn Cultural Center, Ferguson Youth Initiative and Sheldon Art Galleries. Curator Jacquelyn Lewis-Harris stands in front of a collaborative piece created in Ferguson called One Love. It covers seven 4-by-8 foot panels. The show includes several collaborative works. Lewis-Harris said it’s unusual for such a project to live up to artistic standards. “For groups of people to work together to actually come up with one statement on a piece — and then the aesthetic holds together, the color works well and it’s pleasing to the eye — is rather rare,” Lewis-Harris said. Tom Halaska, who coordinated the Ferguson painting effort, said the display is important because it reminds us about a collaboration that emerged from chaos. 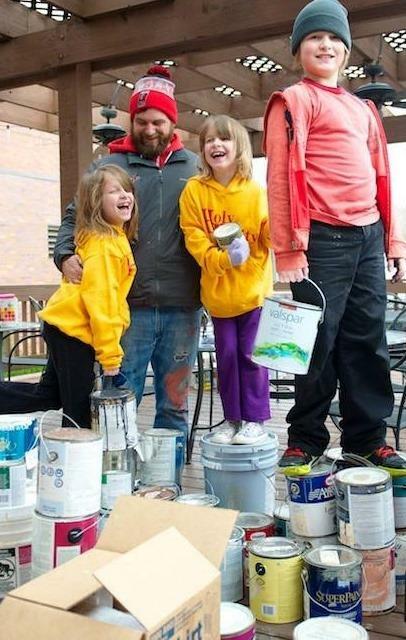 Tom Halaska took his children, now 13 and a pair of 10-year-old twins, to paint in Ferguson. They pose among some of the donated paint. “That the community did come together, that we are willing to work together,” Halaska said. 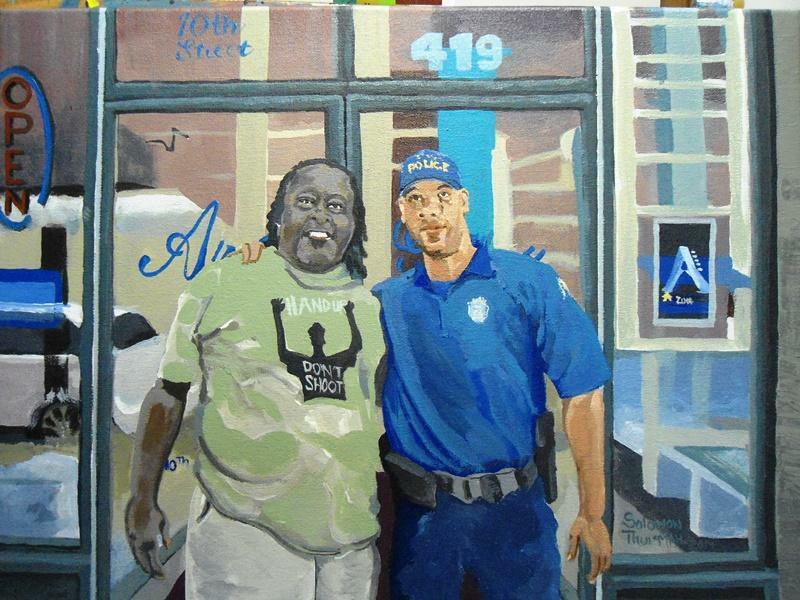 Halaska began putting together the painting project in Ferguson after seeing what others had done on South Grand. Word got out and paint started coming in. “We were getting art supplies mailed from Maryland and Sacramento and all over the place,” Halaska said. People also traveled to Ferguson from other cities to take part, Halaska said. 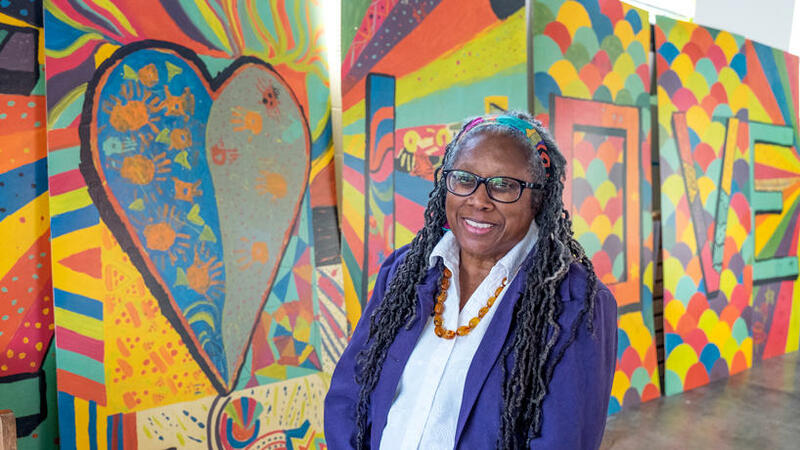 “We had about 500 people, and did close to 175 murals,” Halaska said. 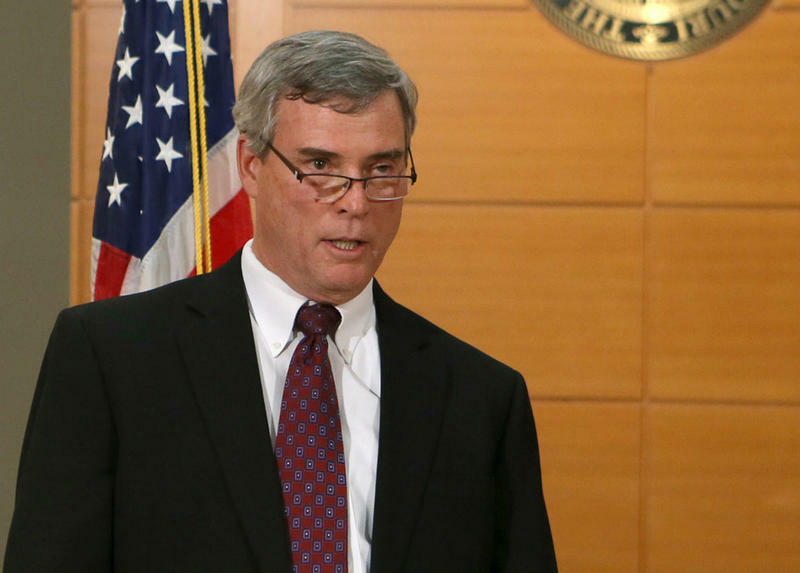 In November 2014 a St. Louis County grand jury ruled against indicting Ferguson Police officer Darren Wilson for shooting Michael Brown. Announcement of the decision sparked protest, and later on in the night, violence wracked Ferguson and parts of St. Louis. The 11-plus miles of actual roadways that separate Ferguson and Ladue might as well be the distance between St. Louis and Shanghai — or at least it feels that way sometimes. The variations and nuances that register in our psyches and imaginations — the old bugaboos of fears, conflicts, realities, prejudices, heritage, history, economics — all of this and so many more obstacles litter a twisting, turning virtual pathway between the two communities.